When you ask people what Legend of Zelda title is their favorite, there are always two answers you’re almost always guaranteed to receive: The Legend of Zelda: Ocarina of Time and The Legend of Zelda: A Link to the Past. Today marks the 25th anniversary for the latter, which is not only one of the author’s favorite games, but is also one of the very first games they played. Originally published for the Super Famicom in 1991 as Zeruda no Densetsu: Kamigami no Triforce (The Legend of Zelda: Triforce of the Gods), it wasn’t until 1992 that American audiences got a chance to play it on the Super Nintendo Entertainment System. A Link to the Past discarded the somewhat controversial side-scrolling elements of its predecessor, Zelda II: The Adventure of Link, and returned to the 3/4 top-down perspective from the original The Legend of Zelda. It was also more of a straight-forward action-adventure title in comparison to the RPG elements of the first two games. Due to the game’s success, A Link to the Past would go on to receive five direct sequels (according to the Hyrule Historia): the 1997 Japanese-exclusive BS Zelda no Densetsu: Inishie no Sekiban (BS The Legend of Zelda: Ancient Stone Tablets) which utilized the Super Famicom’s Satellaview peripheral add-on; the 1993 Game Boy title The Legend of Zelda: Link’s Awakening (re-released for the Game Boy Color in 1998 as The Legend of Zelda: Link’s Awakening DX); the 2001 Game Boy Color titles Oracle of Seasons and Oracle of Ages; and the 2013 Nintendo 3DS title The Legend of Zelda: A Link Between Worlds. Today, A Link to the Past has been ported to the Game Boy Advance and the Virtual Consoles for the Wii, the Wii U, and New Nintendo 3DS, ensuring that future generations will continue to enjoy this classic Super Nintendo Entertainment System title. But what made A Link to the Past so memorable, so outstanding, that so many publications today recognize it as one of the best video games ever made? It’s quite simple: A Link to the Past is the origin for the vast majority of plot elements, tropes, and mechanics that have become staples in the The Legend of Zelda franchise. Whether they’re original contributions to the series or simple refined elements introduced in The Legend of Zelda and Zelda II: The Adventure of Link, A Link to the Past is what made them the beloved parts of the franchise that they are. Many players are familiar with the triple-deity religion that makes up the backbone of the game lore: the Goddesses Din, Nayru, and Farore who created the land of Hyrule, and left behind a symbol of their power in the Sacred Realm—the mythical Triforce. While the individual Goddesses and their association to the individual parts of the Triforce wouldn’t be elaborated on until Ocarina of Time, A Link to the Past was the first game to introduce that lore to the series. This also marked the move from the vaguely Christian religious tones found in the Japanese-versions of The Legend of Zelda and Zelda II: The Adventure of Link (which made translation into English difficult, due to Nintendo of America’s policies at the time). A Link to the Past is also the first place that we see the Triforce in a complete, unified state. While we see the individual parts of the Triforce in the first two games (the Triforce of Power and shattered Triforce of Wisdom in Legend of Zelda, the Triforce of Courage and the disjointed pieces in Zelda II: The Adventure of Link), A Link to the Past is the first game to really push the form borrowed from the historical Hōjō clan into players. This is also where the the consequences of making a wish on the Triforce emerge; without a pure heart, your wish is corrupted, as Ganondorf found out the hard way. We are also introduced to the lore of the Master Sword; how the sword was forged to protect the land of Hyrule and how only one deemed worthy can wield it in battle against evil. Visually the Master Sword takes its oddest appearance in the franchise here; while its in-game sprite depicts it with the blue/purple hilt and guard that is consistent throughout the franchise, official artwork for A Link to the Past portrays it with a red hilt wrapping, and bronze pommel and guard. The pommel is also slightly smaller than it is in later games, appearing almost flush with the hilt. 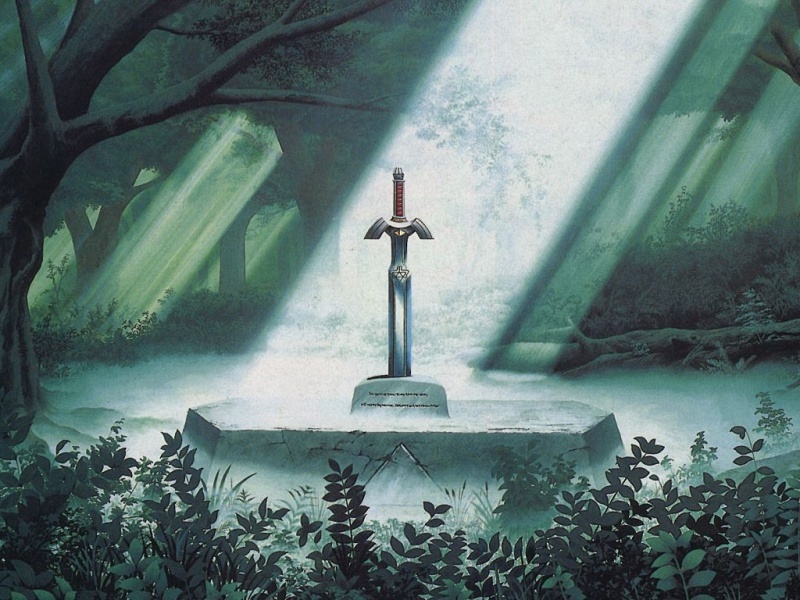 “Master Sword in the Lost Woods” – Artwork from The Legend of Zelda: A Link to the Past Nintendo Player’s Guide. However, the biggest contribution to The Legend of Zelda franchise that A Link to the Past makes is its plot structure: three dungeons, a big plot twist, and multiple dungeons afterwards. Typically the plot twist is accompanied alongside the player obtaining an item of great significance (usually the Master Sword). This has the effect of limiting the non-linearity from the first games; the dungeons found in those games could be defeated in any order through clever gameplay, although there typically was a recommended pattern to beating the dungeons. While it may not seem like anything spectacular these days, this was groundbreaking for its time. Here we’re also introduced to another of the most iconic elements of the franchise: the Spin Attack. While the real-world practicality of standing still and swirling in a circle, sword extended is debatable at best, its firmly cemented itself as a powerful attack for the player character, and one of the first things learned in-game once a sword is acquired. The Legend of Zelda franchise just celebrated its 30th year anniversary this year, and while we owe it all to one little title on the Famicom, the series wouldn’t be what it is if it wasn’t for A Link to the Past. Stay tuned to TechRaptor for further coverage of notable upcoming game anniversaries. What are your thoughts on The Legend of Zelda: A Link to the Past? Let us know in the comment section below.